Billionaire currency trader Joe Lewis is building quite a reputation for himself in another financial field: Art collecting. Bloomberg reports he recently made a strong bet on the value of a work by artist David Hockney, and its sale for $90.3 million – in addition to representing a strong profit for Lewis – also makes Hockney "the most expensive living artist at auction." The work in question is entitled Portrait of an Artist (Pool with Two Figures), and was purchased by Lewis back in 1995 for an undisclosed price from entertainment exec David Geffen, but his betting instincts came not just in whatever profit margin he made but the fact that he declined to offer the painting up to bidders with any reserve, which would have locked in a minimum price. He was instead so confident that the painting would reach or exceed its presale estimated value of $80 million that he went the unusual route of selling it without any guarantee, a strategy that was vindicated by the record-breaking sale of the painting. Because of the fact that it was being sold with no guarantee, the bidding could have theoretically started at just one dollar. Instead, the reported opening bid was $18 million, eventually going to one Marc Porter, who took it home for $90.3 million, including a $10.3 million buyer's premium. Prior to the sale, the most expensive living artist at auction was Jeff Koons, who held the distinction since 2013, when his Orange Balloon Dog sculpture was hammered out for $58.4 million. Of course, both Koons and now Hockney still have a ways to go if they want to be the most expensive living artist period, since Jasper Johns' piece Flag went in a private transaction to hedge fund billionaire Steve Cohen in 2010, when he paid roughly $110 million for it. 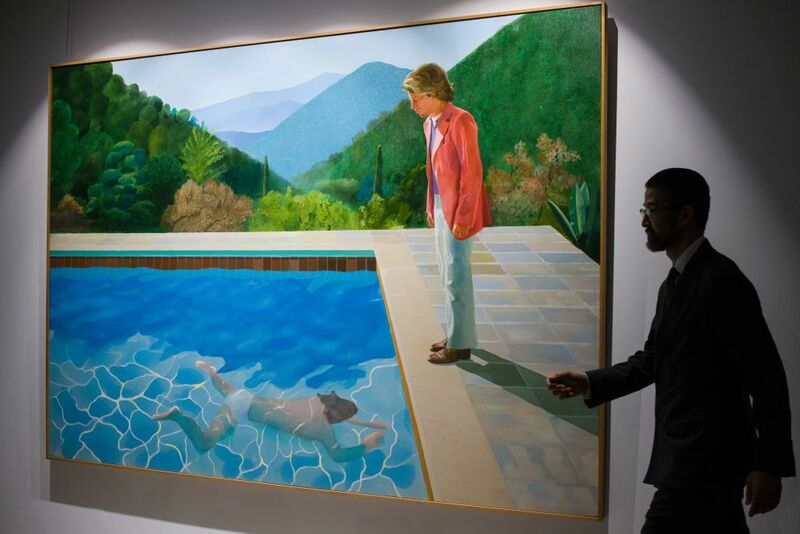 Meanwhile, this more recent sale was quite a leap in value for Hockney, whose previous auction record was set in May, when his 1990 painting Pacific Coast Highway and Santa Monica went for $28.5 million.